Under Armour shoes are already well known for the quality and standard that they have for the sporting market. Many of shoe models of Under Armour are hailed as one of the best ever in terms of overall performance and durability, competing against some of the more known brands in the industry. Within this brand, areall-purpose models, models that are specifically built for one sportand those that are simply dedicated to one sporting professional, just like Under Armour Black Ice shoes. 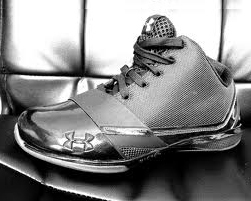 The idea of the Under Armour Black Ice shoes line was one out of the many Under Armour product lines under their contract with Milwaukee Bucks’ point guard, Brandon Jennings.They needed another line of basketball shoes aside from the other basketball shoe models that was already endorsed by the young basketball player. The name “Black Ice” was actually thought up by Brandon Jennings himself, naming the product line after the name of his favorite car freshener. As one of the most unique basketball players in terms of his professional history, his partnership with Under Armour may have been just right, setting a distinct name against the more popular and traditional shoe brands like Adidas and Nike. What’s Unique About Under Armour Black Ice Shoes? In terms of overall design and function, it is still technically the same as a pair of Under Armour basketball shoes. So what makes it different then? Style is the keyword in this product line. A typical pair of Under Armour Black Ice shoes would always feature a forefoot strap. The forefoot strap is used for its “lockdown” feature, which enables the shoe to have a firmer grip of the wearer’s foot. In addition to this, Under Armour Black Ice shoes are also designed with an asymmetrical ankle which keeps the cut low, adding to the shoes’ flexibility and mobility. A pair of Under Armour Black Ice shoes is usually best suited for younger players. Under Armour Black Ice Shoes: Different From Regular Under Armour Basketball Shoes? The most direct and absolute answer is, not really. What we mean is that, it is not that different if we are to observe the fact that its features are used with the enhancements that are almost similar to other Under Armour basketball shoes. In the end, the forefoot strap still mimics the role of the FootSleeve feature, only at a (cumulatively) greater degree. Judging by the variety of great designs in this product line, Under Armour Black Ice shoes could be directly aimed at enthusiasts who might want a different tone and style from the Under Armour basketball shoes they are previously using. The forefoot strap is the most distinct feature of his shoe product line. This feature is used in tandem with other safety features to further increase the potential level of comfort that it could have. The color schemes are not completely different, but its designs loudly tell that it is a different product line. All in all, holds all the necessary features an ordinary pair of Under Armour basketball shoes have, only using a slightly different design template. Treat one pair as a “Limited Edition Jennings’ Special” release. As it is still considered as a basketball shoe, a pair of Under Armour Black Ice shoes would still have the same distinct stylish outsole (which sits exactly beside the forefoot strap), a mark of proof that guarantees the professional quality of any Under Amour shoe.